Chardonnay by Massoni of Mornington. Barrel fermentation characters are also apparent. Massoni were at the forefront of establishing Mornington with a definable genre of Chardonnay. 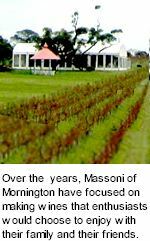 Massoni's vineyards are the pick of Mornington's cool climate sites. A long, satisfyingly dry yet fruit and stone filled finish. In 1997 Ian and Wal Henning, founder of Taltarni and Warrenmang, engaged the assistance of the Stanford Group to develop GlenKara Estate, a 300 hectare vineyard in the Pyrenees region, which provides Massoni with the majority of shiraz, cabernet sauvignon and merlot. In 1998 the mid price Homes range was introduced. Currently, the majority of production is sold to restaurants or exported. Massoni strive for low cropping levels which not only means that the vine is able to sustain a level of crop from year to year but also able to provide better fruit characteristics as the nutrients it produces are infused into fewer grapes, producing grapes with a greater concentration of fruit flavours. A vineyard’s soil profile and the region’s climate is a major factor that determines the quality of the grapes which will be harvested. Massoni’s vineyards are considered to be cool climate vineyards. This means that grapes mature on the vine for a longer period enhancing both the fruit flavour and the colour extracted. Planting the appropriate varieties on a vineyard site is vital. In order to optimise fruit characteristics you need to select the correct clones of a variety. Different vine clones will effect growth rates, crop yields and the ability of a vine to withstand climatic variations such as droughts. All of which will influence a wine’s composition. A healthy vine will produce quality grapes. Poorly managed vines or over cropped vines will not only produce inferior fruit but will cause vine stress. This generally results in the vine shutting down in an attempt to recuperate. Stressed vines are known to produce well below average crop yields for the following two vintages. Traditionally harvesting commences in early April through to late May. All vineyards are inspected prior to harvest and only Massoni quality grapes are processed. The vineyards are harvested in batches and each is crushed independently. This enables the winemakers to adjudicate whether the wine produced will be able to make a Massoni wine. It also allows rewards those that produce each vintage’s outstanding fruit. Wines that are not selected for a Massoni product are then sold off. The Massoni wines are then placed in 220 litre oak barriques where they will be matured for up to 20 months. Balancing oak and wine characteristic is an artisan skill which is nurtured over successive vintages. Although as a general rule 1/3 of Massoni wines are placed in new barriques, 1/3 in 1 year old barriques, and 1/3 in 2 year or older barriques. The winemaker will match each batch of wine to whether it requires a high, medium or low toasted oak barrique. The toasting of a barrique influences the extent of the oak sensation within a wine. Barriques are shaved each year by a qualified cooper and generally have a lifespan of up to 5 years. At a price of between $800 to $1,500, oak barriques are the highest perishable cost of any winery. A wine’s characteristics will progressively alter with different wines maturing at different time frames. At 36 weeks of age Massoni’s winemakers will do the first of 3 barrel tastings. Whereby each barrel is assessed and scored out of 3. Barrels graded 1 out of 3 are sold as bulk wine, those graded 2 out of 3 are destined for the Homes range and 3 out of 3 will make the Massoni label. At 42 weeks and 50 weeks the wines are scored again. By this stage the Homes range will be blended for bottling whilst the Massoni wines will be retained in barriques for a further 6 – 8 months. Wines are released some 6 months after bottling. This provides sufficient time for the wines to settle and be made available for the ultimate test, the drinker's satisfaction.